National Bike Month was established in 1956 by the League of American Bicyclists to celebrate people who love to bike and entice those who don’t to join the movement. The benefits of biking are many, from financial to environmental to looking at the neighborhood from a new perspective. Try bringing the two-wheeled spirit to the community with organized biking challenges and competitions. If employees aren’t convinced, hit them with some of these facts from the League about how biking makes the world a little better. Money: Personal costs are cut every which way when someone makes the change from driving to biking. There’s no need to worry about finding parking, paying for parking or coming out of the office to a parking ticket on the windshield. Bikers also buy less fuel and have fewer maintenance issues to pay for. The League of American Bicyclists found that Americans saved more than 4 billion dollars by biking instead of driving in 2012. Health: The actual figures don’t need to be shared for people to know that obesity is a problem in America. However, employees might be interested to know that data from the League of American Bicyclists showed that 10 miles of biking allows a 180-pound man to burn 400 calories and a 130-pound woman to burn 300 calories. According to the Transportation Research Board, more than 80 percent of bike commuters think their health has improved since switching from other transportation methods. From an employer standpoint, it was reported that employees who regularly ride to work take 15 percent fewer sick days and accomplish more. Mother Earth: Bicycle commuting reduces air pollution from automobile emissions. According to the League, the atmosphere was saved 13 million pounds of greenhouse gas emissions during the 2012 National Bike Challenge. Local businesses can promote National Bike Month as encouragement for members of the community to take advantage of public parks and bike trails. It’s the perfect time to renew or garner interest in biking because the weather is warming up and spending time outside is becoming more attractive. Consider handing out sports bottles with the company logo to customers who arrive on bikes as an incentive to switch transportation modes. It may be a good idea to make or buy an outdoor sign that denotes a bike-friendly business. Additionally, consider installing bike racks out front. For people who seem interested in joining the movement, provide maps of nearby bike-friendly areas so they know exactly where to go. Schools can add to the community celebration by promoting the merits of biking to school. An assembly on bike transportation should include information about safety measures such as helmets and proper footwear as well as the importance of locking bikes up to avoid theft during the school day. Look into distance challenges that will persuade students to choose bikes over busses and cars. Offer prizes like the Promotional Drawstring Bag or the Promotional Microfiber Backpack for the top riders to use while peddling to school. 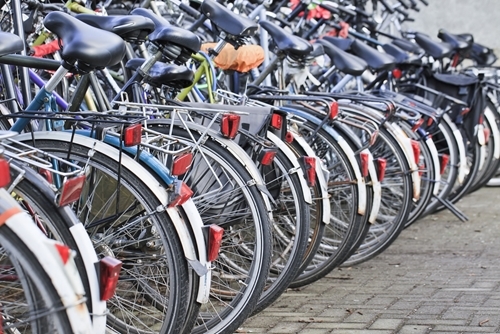 For businesses that are located in a central or urban area, organize a day for biking to work. If participation is satisfactory, try making biking to work a monthly occurrence. Declare a goal for what percentage of employees will use bikes for transportation. Whenever the company hits that goal, increase it for the next month. For additional competition, have staff track the number of miles they bike in a month. Keep the data public so people are inspired to ride more and take down whoever is in the lead.